Doesn’t matter if you run a million-dollar company or are a part of any growing startup, chatbots will eventually develop to become a distinguishing factor for an entire business; a determining factor between the best and the rest. But this also doesn’t mean that simply investing in the technology without knowing the specific needs and objectives customers are expecting from your service or product will produce equal positive results. With 10,000,000,000+ messages a day ‘Texting’ has become a natural and preferred way of communicating these days. More than 1000 companies are working on 100+ features to make this experience of communication between bots and humans perfect, and amongst all these features, the most extensive is conversation design. Conversational Design is altogether another zone of outline which has come to fruition because of the growth of chatbots. Unlike other user interface paradigm where the user can select a button or click on the provided text service option to let users know what the app or website can provide or do, with conversational design users can experience and discover what service can your app or website can provide in a conversational pattern. Dialogue is a conversational model itself. It’s back and forth conversation that goes in between the bot and the user and you have to design for that. It is really important to design the dialogue in such a way that is most suited and comfortable for the user. Texting over Facebook, WhatsApp, or any social media platform has never been hard for us in, then why is there such a fuss about conversational UI being a big thing? The answer is simple. 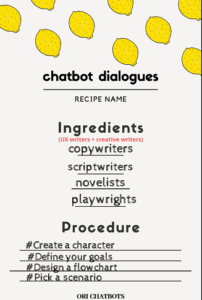 Writing dialogues for chatbots needs to be targeted well to bring the users closer to his goal. Also, the dialogues should be smooth in its approach to drive the conversation forward without the user feeling disinterested or unattached. This can be easily understood by the example of filmmaking and how every dialogue is important to form a connection with the audience. Authors, dramatists, and screenwriters are above all others at composing dialogues. They see how to utilize dialogues to unfurl a story and guide a legend on his excursion. They use dialogue to express emotions rather than telling it in a simple monotonous way. Here is an example from a popular movie that won an Oscar for its best writing adapted screenplay. Great creative writers ensure that each sentence has no less than two of the above functions. So rather than simply propelling the story, the sentence could likewise disclose to us something about the character or environment in the meantime. The Setup: It’s an average night out at the favourite local hangout of low-level mobsters Henry Hill (Ray Liotta) and Tommy DeVito (Joe Pesci). Now if just look at these dialogues and don’t think of what happened next in the movie, not only do these dialogues carry the story forward, they also narrate something about the characters, Tommy and Harry. in the scene, Big-mouthed Tommy is superior to harry in terms of rank or status and so is holding court. It demonstrates that the writers (Scorsese and Nicholas Pileggi) have accomplished a one of a kind knowledge into the individual psychologies of the characters as existing separated from their own. Miscommunication happens all the time throughout everyday life. On the off chance that done right, moments of miscommunication can make for the funniest (or grievous) scenes in the whole film. Creative writing has always been a core component when it comes to capturing and attracting a strong customer base for any product or service that is new or flourishing well in the market. Right now, chatbots are ready to trend up and take over but without writing it won’t be a huge success. The character is a very important part of designing dialogues and providing identity to chatbots (we will discuss the importance of character in detail, further in this article). But along with the character, the next integral part is to define your goals. Is your chatbot serving its purpose? Is your chatbot helping customers get their jobs done by analysing and solving issues? These questions need to be answered in the best possible ways and need proper structure to it. next important part of this strategy is to sketch a flowchart before you start off with finally writing dialogues and conversations. Now, before you write even a single word, you need to build a flowchart of the dialogues. Because flowchart can help you see all the possible situations and combinations of answer/reply dialogues for your chatbot that you might overlook otherwise. The next step is “Picking a Scenario”. By this stage, you have a well-structured chart with you which is well planned and analysed. Even though a single piece of dialogue in the chart can have multiple scenarios, each scenario has its own conversational aspect and direction, and this should be kept in mind. Keeping in mind the other possible scenarios when you write dialogues for one single string/path within your flowchart, Don’t bother about the other possible scenarios conversation could have gone. Each customer has one conversation only and the conversation he/she has no relation to someone else’s conversation or journey. 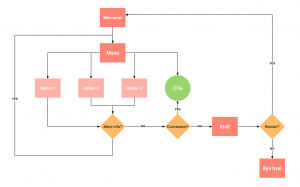 Your flowchart can have multiple scenarios but each customer experiences one scenario only. This is very important for writing conversations. Conversational AI is here to stay and when it is designed very well it can make life easier for us and save businesses a lot of money; as much as 2 dollars/transaction, according to the researches. Add that up and that can be billions of euro. But designed incorrectly you have a frustrating user interface that will drive your customers away. clarity means that user or customer should spend less time in trying to figure out what we mean or how to do things, and spend more time actually doing things. They need to have a clear path to complete their goals. Now, there are two key areas here that we can use to impact clarity! We all know words are powerful, right? The right set of words can be an invitation to create engagement, trust and enthuthiasm with your users or customers. One conversation that sounds natural and how people generally speak in their day to day lives. The latter one sounds unfriendly and not at all conversational. Another important part of clarity is how your chatbot presents options to the user. Keeping in mind the chat needs to be conversational, natural and friendly. So the options that chatbots offers needs to be conversational and not more than 3, since it might overwhelm the user and also sound unpleasant. Here are two examples showing how perfectly options can be blended with conversation to make it look very real and human-like. 2. They know they should pick the color and keep the conversation going. it helps then set expectations and not worry like what should they do next. language should provide clarity to the user and be conversational and friendly. A chatbot should not sound like an IVR! But what happens when you have a lot of options? let’s say you are a stock investment company so it’s not possible to have only 3 options right? it wont work! When you are starting out in terms of clarity, you want to forget all of the coding at the beginning, and start by just writing out the ideal conversation. From initiation to reaching their goals and try to sound it loud so that you can see how it works and then you can build upon it and work on code, and you’ll find as you are writing these conversations the question will come up how should my bot respond in this situation and that’s where the next property comes in, Character! The character or persona is a great guide for writing conversations because it helps you decide just how the bot should respond. Have you ever had a conversation with a customer representative on the phone and you know they are reading from a script?! and you know they are not even really listening to what you are saying; they say the same single thing to every other customer, yes! you don’t want to happen that with your bot! If you do that your bot will risk sounding like a soulless bot that doesn’t please anyone. Instead you want to make sure your bot has distinctive personality and style of talking. How should my bot respond to this situation? Isn’t this is more enjoyable?, you would love to interact with a ticket booking bot, if it talked to you in this way. The goal when you are designing is to not make the user think that they are talking to a human. That’s not the case. You actually should be really clear that they are talking to a bot, and that is why giving a personality to your bot is a crucial thing. because people like it when they see a chatbot talking to them just like a human. All answers here convey the same thing, but how the personality brought difference is what makes this so interesting and gives a feeling that they are are a different person. so what personality your bot should have? Answer is simple. depends on what it’s used for and what is the purpose it is serving. Bots can really build one on one relationship with customers because you can talk to them in individual spaces. If you can design your bot right, it will resonate with humans and you can do this understanding the core need. Coming to the last detailing which is Correction. Encountering small talk is pretty common for a bot and it’s where bots struggle. look at this now! As long as you can focus on clarity and help users achieve their goals and if you add in suitable character and personality while embedding empathy and compassion with a measure of correction, you’ll be a lot closer to having loyal and happy customers.